Organizations will have to provide the right tools for internal processes to function effectively and help relationships between customers and the company to advance into profitable accounts and strategic partnerships. 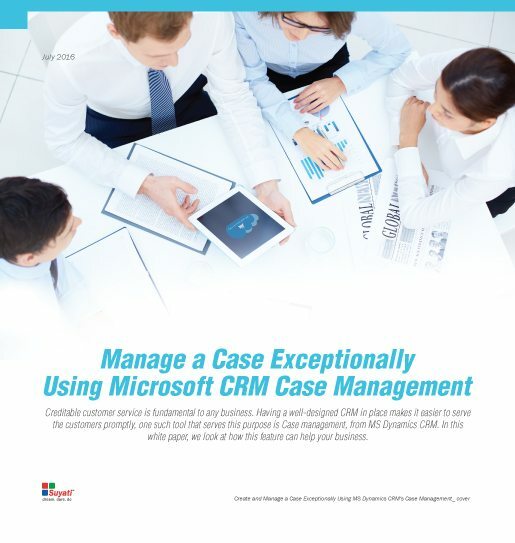 Microsoft Dynamics CRM is one such tool that can help sales team to become prepared and insightful, collaborative and connected, quick and mobile, and highly productive. ‘Case Management’ by MS Dynamics is designed to track the process of customer grievances, right from the stage when a customer gets in touch with the customer service center to report an incident, to going through the remediation process and finally resolving the case. Customer Service Module, one of the most powerful feature of MS Dynamics CRM, allows us to manage and track customer service activities in an organization. The distinct feature about this tool is that, every case or issue received from a customer regarding a product or service until it is resolved, is recorded on a single page. Case management today is much more complicated than it was earlier. As the cases come via different channels and the concerns are not that simple as before, resolving the issues requires more information and interdepartmental collaboration for agents to bring them to a resolution. Fortunately, new developments in analytics, social media, integration, dynamic case management, and gamification enable today’s customer care professionals to get a lot more out of case management than ever before. Download your copy of the whitepaper, to learn more.